Each group of five fat quarters is to be cut into five sections. You can read about the Refracted TNT here. Somehow, I got cut happy and cut the middle group into six sections. Oh well...nothing to do but sew up the pieces. I used two fat quarter collections with a few other fabrics mixed in. I decided to mix up the colours, but am now thinking that I should have grouped all the like colours together. Lesson learned for next time. I'm linking up with WIP Wednesday over at Freshly Pieced. Claiming my Blog on Bloglovin! Who would have thought that I'd have a blog, let alone claim it on Bloglovin. Guess I need to step up my game and ensure I have good blog posts. Oh what fun we had at the MMQG Sew In yesterday. There were new members to meet and fabulous projects to look at. It was a productive day of sewing and fun fellowship. Hop on over to Maritime Modern Quilt Guild for more information about the guild. I finished all the blocks for one of my Library Projects (hop over to Chezzetcook Modern Quilts to read more about The Library Project QAL). It's time to break into the mini bolt of Kona Snow. It's been so great saying I own a bolt of fabric (granted it's only 2.5 yards), but the time has come for Snow to fulfill its purpose as sashing between these blocks. This is based on a project by Elizabeth Hartman over at Oh Fransson. I'll have to start thinking about how to quilt this project. There hasn't been a lot of sewing going on in this house during the month of May. I did, however, get together with my quilt bee, Q-Squared, a few weeks ago. I had pre-cut a few projects, so I grabbed a container and headed out for a sewing day. I made great progress, but while working on the blocks at home a few days later, it hit me...it was not on the Library Project list. I felt so dejected for having put so much time into sewing, but then I got over it -- I was making progress with a project! I'm still linking up with Adrienne over at Chezzetcook Modern Quilts. Here are some of the 48 blocks and then four of them arranged. Hey, Squares. You were right...I should have followed the pattern instructions and sewn the block to the piece of paper. In the end, it was needed to square up the block. argh....I have a few blocks that are off centre because I didn't cut them down accurately. Oh well...life goes on. I had fun making the blocks even though there was a lot of fabric wastage. I'm sure teacher QJ will tell me that wastage is not a word, but the Squares know how much I detest wasting fabric. Pause....I've gone to the dictionary....wastage is a word!!! It means: wasteful use of something valuable : loss of something by using too much of it or using it in a way that is not necessary or effective. So true, so true!!!! 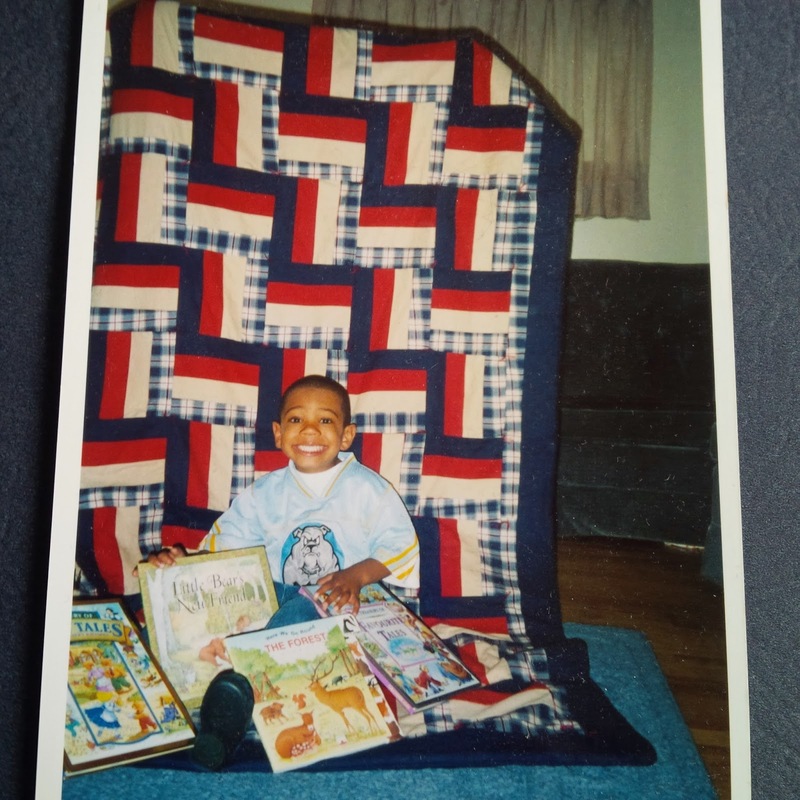 As I cleaning, okay attempting to clean, my sewing room, I stumbled across a photo of my very first quilt. I realize that I have been quilting for 10 years. I made my first quilt for my nephew L in the fall of 2003 for his fourth birthday. He was so cute back then. I took a class at my LQS and made a flannel rail fence. I think the quilt has now gone on to quilt heaven, but nephew L has received many more quilts from me to make up for it. In the early days, I didn't take photos of my quilts or keep track of the quilts I made. I need to organize my quilt book and ensure that I have a photo of all my quilts. It's interesting to look back and see how far I've come along. I'm off to a Sew In on Saturday with Maritime Modern Quilt Guild so I need to decide on which Library Project to work on. In an effort to get back to more regular sewing, I'm going to pre-cut several projects over the coming weeks.